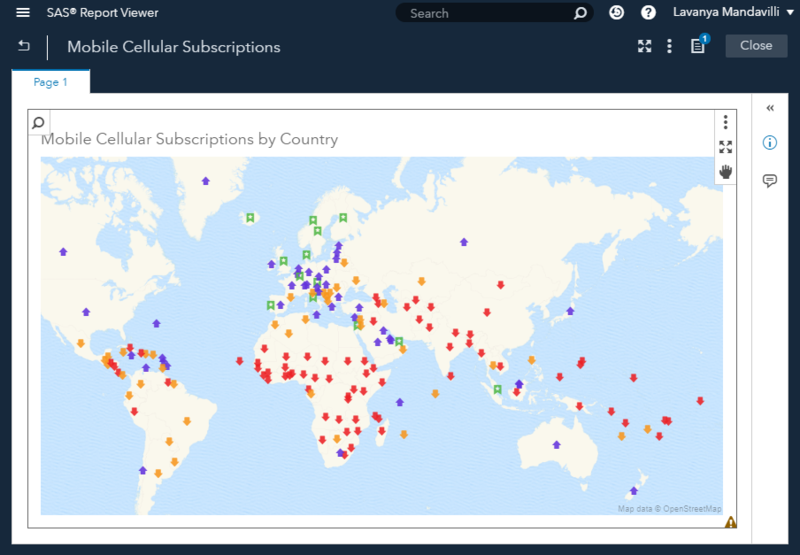 SAS Visual Analytics supports region maps for Country, US states, and provinces out-of-the-box. These work well for small scale maps covering the world, a continent, or a single country. However, other regions are often needed. Beginning in version 8.3, VA supports custom polygons to display regions such as sales territories, counties, or zip codes. 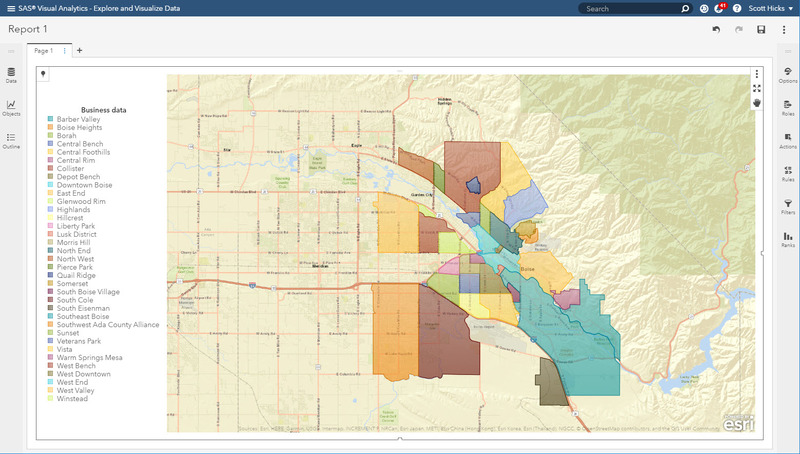 VA supports two sources for creating custom polygons: Esri shapefiles and Esri Feature Services. The goal for this post is to show how to create custom polygons using an Esri shapefile. 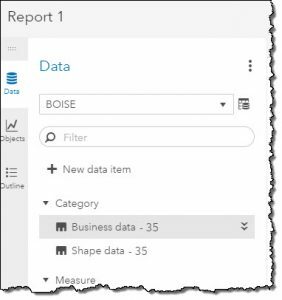 Typically, when working with custom polygons, you will have two datasets: the first defines the custom regions (shape data) and the second contains the data you wish to map (business data). The shape data is derived from an Esri shapefile or feature service. The business data can be in a shapefile or any format supported by VA (.sas7bdat, .csv, .xls, etc). It contains the information you want to analyze distributed across the regions defined by the shape data. It is recommended that you verify the imported shape data before using it in your final map. This will confirm the data is valid and make debugging an issue easier should you encounter any errors. To verify, use the same dataset for both the shape and business data. The example below will use this approach. 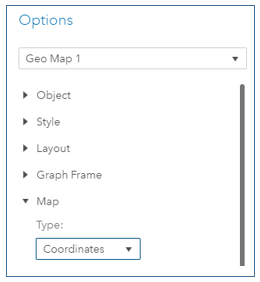 The shape data defining the custom regions needs to be in an Esri shapefile format. 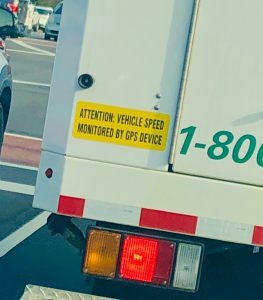 These files can be created in a GIS application or obtained from a wide variety of online sources such as: the US Census Bureau (http://www.census.gov); local and state municipalities; state agencies such as the Department of Transportation; and university GIS departments. Most municipalities now have Open Data portals that provide a wealth of reliable data for public use. These sources are maintained by dedicated staff and are updated regularly. The business data can be specific to your company’s operation or customer base. Or it can be broad and general using census or demographic information. It answers the question of What you want to analyze on the map. The business data must contain a column that aligns with your shape data. 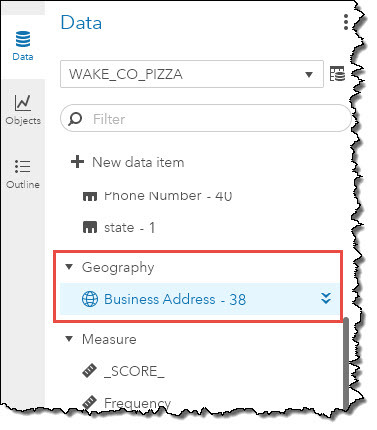 For example: If you want to map the age distribution and spending habits of your target customers across zip codes, then your business data must have a column for zip codes that allows it to be joined to a zip code region in the shape data. VA 8.3 does not support the native shapefile format. To use a shapefile in VA, you must first import it into SAS. Included with Viya3.4, the %shpimprt macro will convert a shapefile into a SAS dataset and load it into CAS. You can find the documentation for it here: %shpimprt documentation. Additional details and sample code for each of these steps can be found in the text file linked here: Manual shapefile import steps. Next, we must import the dataset into VA, if using the manual shapefile import process. To do this, locate the data pane on the left of VA. From the ‘Open Data Source’ window, select Import > Local File. 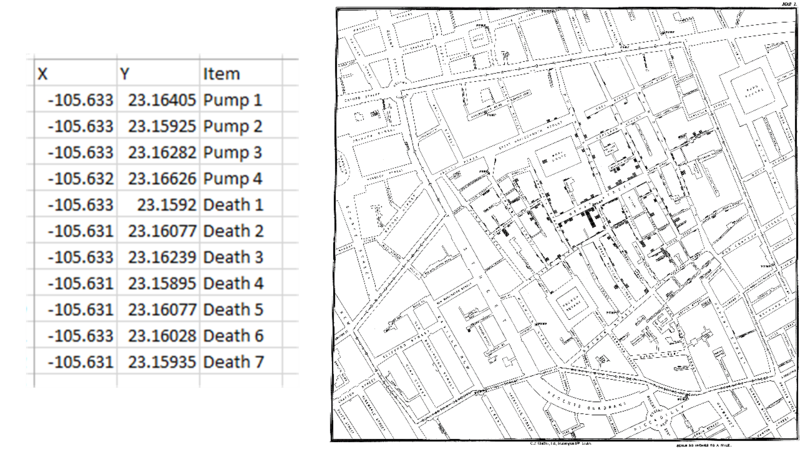 Navigate to the location of the SAS dataset created from Step 2 and click the Open button. Adjust the target location as needed, based on your VA installation, and make note of the location selected. This path will be required to configure the custom polygon provider. Review and adjust the other options as needed. Click the blue ‘Import Item’ button at the top of the window to start the import process. A message will appear indicating the import status. Upon successful import, click the 'OK' button to open the dataset. We are now ready to start creating the geography item. With Custom polygons, an additional step is required beyond what was described in previous posts with predefined and custom coordinates geography items. We must define a Custom Polygon provider so VA knows how to locate and display the Boise Neighborhood Associations. This is needed only once and is part of the geography item setup you are familiar with. Our goal is to map the regions of the Boise Neighborhood Associations, so we will use ‘Shape data’ for our geography item. 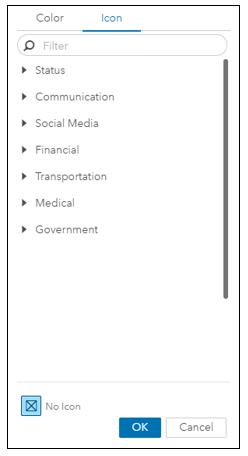 Locate it in the VA data panel and change its Classification type to ‘Geography’. From the ‘Geography data type’ dropdown, select ‘Custom polygonal shapes’. Several new fields will be displayed. In the ‘Custom polygon provider’ dropdown, click the ‘Define new polygon provider’ button. A ‘New Polygon Provider’ window will appear. All fields shown are required. The Advanced section has additional options, but they are not needed for this example. Type – The default CAS Table is the correct option for this example. Server / Library – These values must match those used for the data upload in Step 3. The custom polygon provider is now configured. All that is needed to finish the geography item setup, is to identify the Region ID. 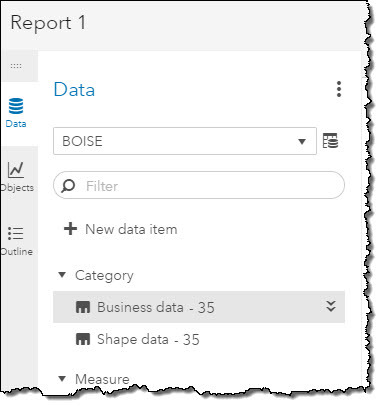 This is the crucial step that will join the shape data to the business data. The Region ID column must match the ID Column chosen when the custom polygon provider was setup. Since we are using the same dataset in this example, that value is the same: OBJECTID. 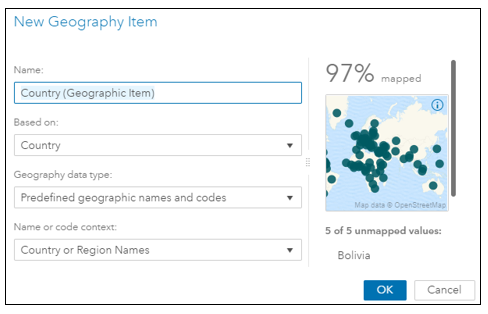 In cases where different datasets are used for the shape and business data, the name of Region ID and ID Column may be different. The column labels are not important, but their content must match for the join to occur. Notice that once you select the correct RegionID value, the preview window will display the custom regions from the imported shape data. The Latitude and Longitude columns are not required in this example. Click the ‘OK’ button, to finish the setup. Final map with custom polygons. Congratulations! You have just created your first custom region map. 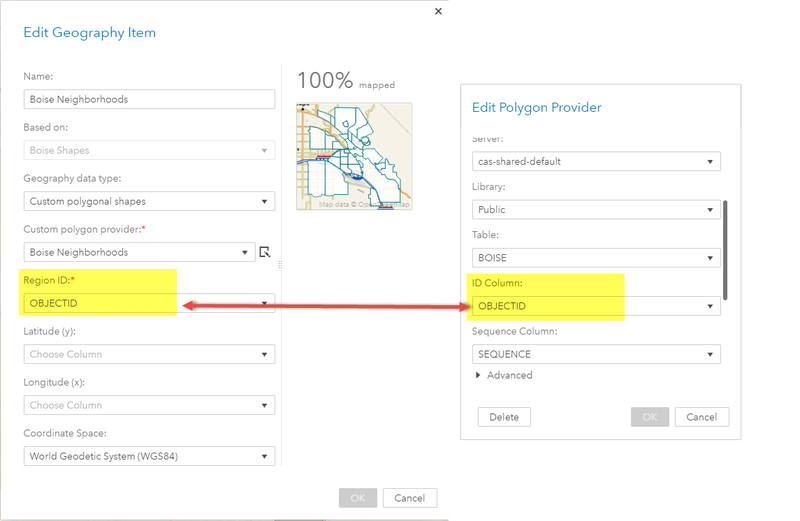 In this post we discussed how to use the Custom Polygon provider to define your own regions using an Esri shapefile. Compared to the Predefined and Custom Coordinate options, custom polygons give you additional flexibility and control over how your spatial data is analyzed. 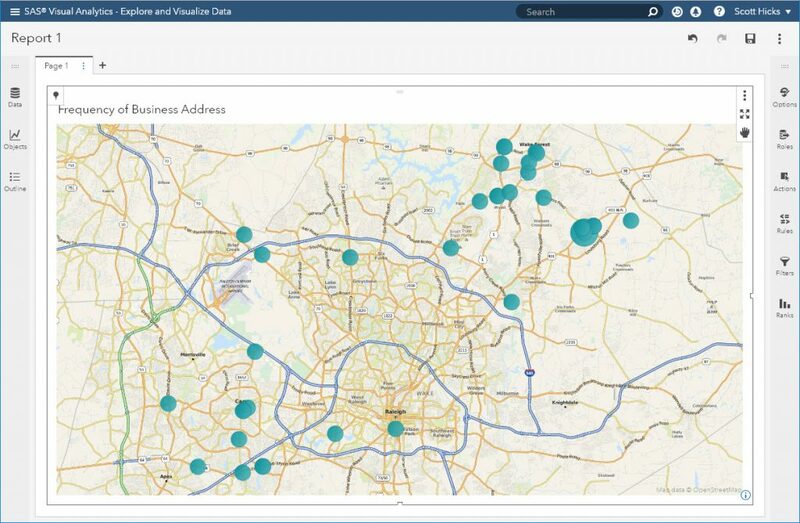 Creating custom region maps with SAS Visual Analytics was published on SAS Users. Jazz up your Geo Map or Network Analysis graph by applying icon-based display rule markers instead of color markers on the map. With SAS Visual Analytics, you may have already used display rules by populating intervals or adding color-mapped values for report objects. 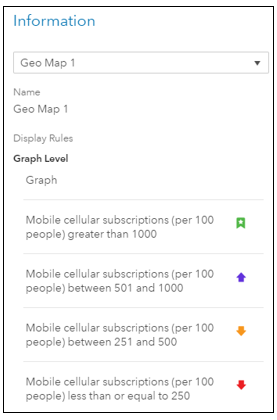 Now, you can jazz up your Geo Map or Network Analysis object by choosing from a curated set of icons and applying icon-based display rule markers. When your mouse hovers over an icon, the name of that icon is displayed. Here are the steps I followed to setup the icon-based display rules. 1. In my new SAS Visual Analytics 8.2 report, I went to Objects, chose Geo Map (available under Graphs) and dragged it over to the blank canvas. 2. From Data, I searched for my data source and added it to the report. 3. In my data source, I highlighted the category (Country), right clicked, and selected New Geography. 4. In the New Geography Item dialog, I entered a name for the new geographic item that I was creating: Country (Geographic Item). 5. I select the Geo Map, go to Options in SAS Visual Analytics and scroll down to Map. 6. By default, the Type is set to Bubbles. I change it to Coordinates (this is a requirement to create the icon-based display rules). 7. The default size for the Marker size is 11. I change it to 14 because I would like my markers to show up slightly bigger in the Geo Map. 8. By default, Legend is displayed for the Geo Map and Visibility is set to On. I chose not to display Legend information for the Geo Map, so I chose Off for Visibility. 9. 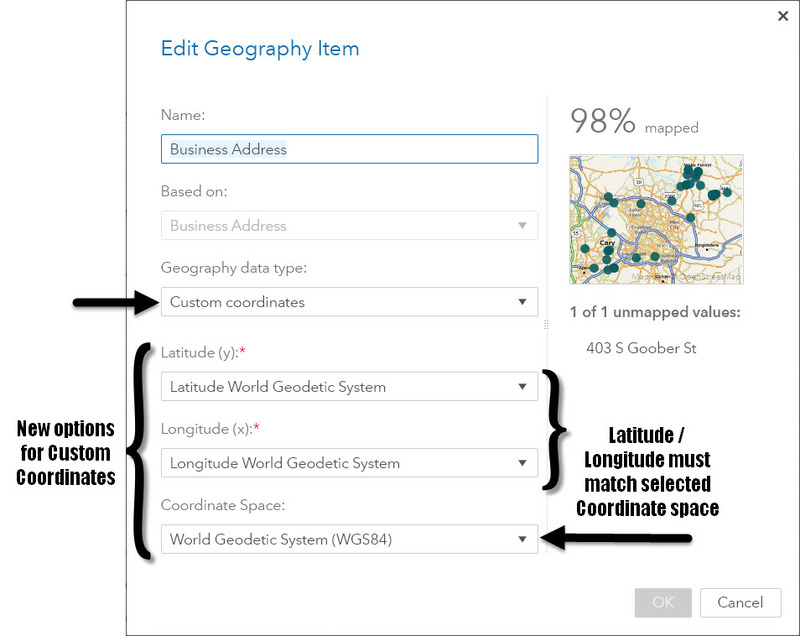 I choose Roles, and I am ready to assign the geographic data item to Category. So I choose the Country (Geographic Item) that I had just created, and drag it over to Category. I now see the Country (Geographic) data role applied to the Geo Map. 10. 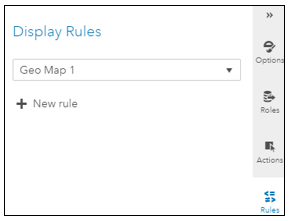 I click on Rules and under Display Rules, I click on New rule. 11. 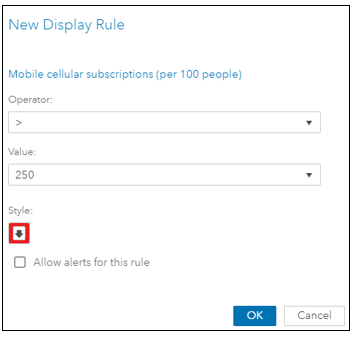 In the New Display Rule dialog, I chose <= for Operator and entered a 250 for Value. 12. 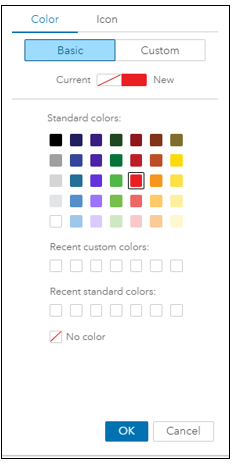 I click on Style and choose Red as the color for this display rule. 13. 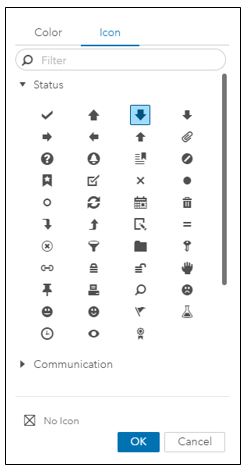 I click on Icon, and I am presented with seven categories for the icons. When I hover an icon, the icon name is displayed. 14. I click on the Significantly Lower icon and click OK.
15. A quick review of what I just created and I click OK.
16. I continue to create three additional display rules for my Geo Map. 17. When all of the display rules have been created, the Geo Map displays with the colorful icon-based display rules applied to the various countries. 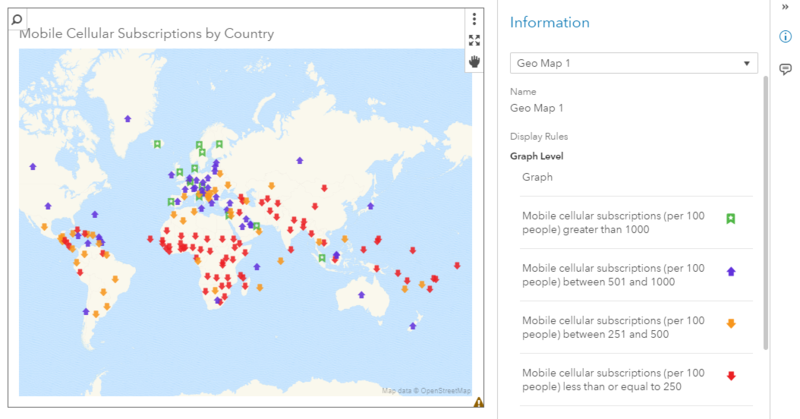 You’ve just seen how you can create icon-based display rules for a Geo Map. You can also create icon-based display rules for a Network Analysis object as well. Jazz up a Geo Map with colorful icon-based display rules was published on SAS Users.